Use your Mission Telescope, Periscope, and Microscope. Your team needs a clear scope. The scope of a team is what the team sees, what it is focused on, the object of its work. Scope is the lens that sharpens the focus on mission and context. When a team has a clear scope it experiences energy and a sense of satisfaction as it achieves its mission. A team can be in a presbytery or mid council whose mission is to resource the worship, witness, and mission of congregations. Or, your team could be at work, in school, or simply be your family. Whatever your team, it requires a shared clarity and focus to achieve success. Like a magnifying glass focuses the sunlight's energy into a powerful beam, clarity makes for better decisions and confidence in aligning the priorities, process, and resources to achieve the team's vision. How does your team see the convergence of mission and context? What does your team focus on? Does your team sometimes appear to be little more than a collection of individuals sitting around the table focused on their own needs? When the team seems preoccupied with itself, staring inward, more effective lenses are substituted for mirrors, as if each member reflects back only what is sitting across the table. Mirrors are not lenses. The uniqueness of each individuals' gifts, ideas, experiences, skills, and competencies are honored and optimized when the team has a clear scope. Let's look at three scopes your team can use to be more effective. Mission Telescope: A telescope allows the viewer to observe an object from a great distance away. In our work, we often view congregations with a telescope, from a distance. We can learn a lot at this distance because we can zoom in and out to be attentive to a church's activity and energy. Often the church cannot see themselves as clearly as others can using the mission telescope. For the team, the telescope removes local distractions so the object stays in view. We can also choose to view the church's immediate context, take look across the street from the church, for example, look around and gain a better understanding of church and community intersections. When we share our discoveries with the church's team, they gain a bigger perspective, too. The mission telescope brings activities of the church into view. Mission Periscope: A periscope lets the observer view the object around obstacles and barriers. In mission work, we can see the church's effects and outcomes in the community. The mission periscope allows us to celebrate a church's positive contributions to the community. What is the community engagement? Since the periscope allows us to see around barriers that can inhibit the church's own view, we can offer guidance that increases the impact of the congregation's ministry in the world. The periscope can provide important insight into the jobs to be done in the community, offing connecting points to a healthy church. The mission periscope lets us see the context, even around the corners and brings the impact of the church into view. Mission Microscope: A microscope allows the observer to view an object up close, and under the surface. Zooming in on a congregation's mission with a microscope helps to understand the church's spiritual DNA, its core values, the fears and driving forces that influence the congregation's ministries of worship, witness, and mission. What to gain insight into framing your congregation's signature ministry? Then you'll want to resonate with the spiritual assets that can be identified with the mission microscope. The microscope also helps identify damaging or impaired behaviors within the church's leadership that without a deep look remain hidden. Does the congregation demonstrate an authentic sense of community in its processes and in the way it allocates resources? The microscope can help encourage higher levels of functioning. Congregations benefit when relevant and reliable data is available to think more deeply about what God has called them to do. The mission microscope lets us see within the congregation and bring the church's health and wellness into view. What lenses do you use in your work? 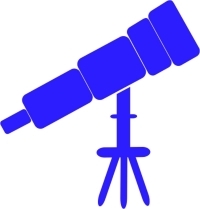 Are you ensuring that your team's scopes are working optimally? How can we attain a more complete view that would lead to greater congregational wellness and effectiveness? How will you use your telescope, periscope, and microscope to scope your work? Scope your work. You will be energized by what you see.